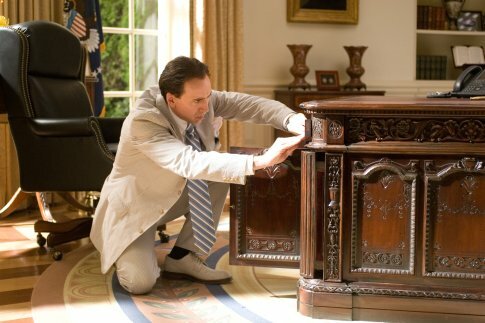 If you’ve watched the film National Treasure: Book of Secrets, then you probably recall Nicolas Cage’s daring break-in to the White House and Buckingham Palace in order to steal ancient Olmec rune stone maps secreted away in hidden compartments within what he refers to as the “twin Resolute desks”. While Nicolas Cage is unarguably resourceful and clever in his fanciful investigation, the New Bedford Whaling Museum would like you to know that there is more to this story than meets the big screen. The HMS Resolute was a 600 ton British ship under the command of Sir Edward Belcher specifically designed for exploring the freezing Arctic. The Resolute set out in 1852 with the goal of finding the lost Franklin expedition, a team of explorers that had disappeared around 1848 and had, by that point, already perished.1 Ironically, the HMS Resolute promptly became ice-locked, and the crew was forced to abandon ship in 1854. The British magnanimously waived their claim to the Resolute. 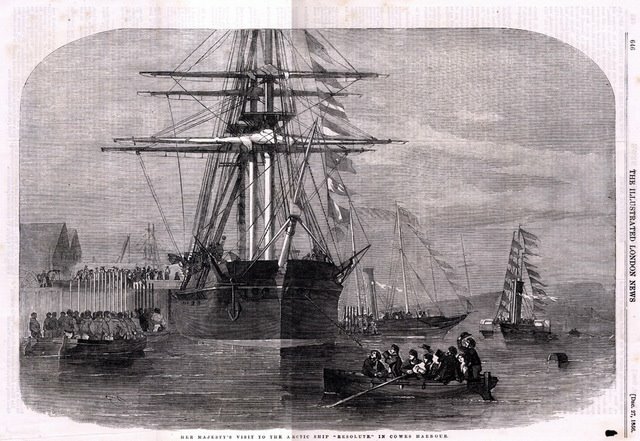 However Congress, goaded on by Henry Grinnell (a wealthy business man who had funded several rescue attempts for the Franklin expedition), decided to buy the Resolute from Buddington for $40,000 and return it as a gift to Queen Victoria, symbolizing the friendship between the two countries. For the record, I’m sure Buddington would like everyone to know the he never received a penny of that $40,000—by the time it was disbursed in 1857, the company who owned the George Henry had been bought up by Henry P. Haven, who left Buddington completely out of the loop. The Queen graciously accepted the salvaged Resolute with a characteristic “I thank you, sir”. In 1879, the entire ship was dismantled, and its timbers were fashioned into a number of artifacts which the Queen presented to some of the parties involved. Back to Nicolas Cage, standing in front of the Eiffel Tower: by talking to a few French policemen and performing some impressive acrobatics of free association, Cage solves the latest riddle5 and determines that the “twin Resolute desks” contain his next clue. Nicolas Cage figures that the second desk (containing the second half of the ancient Olmec treasure map) is located in Buckingham Palace. Not so, Mr. Cage! 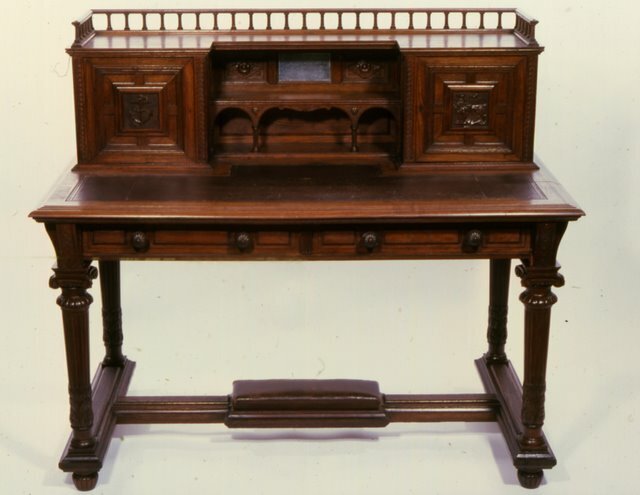 The second desk, which is considerably smaller and modest in comparison to the President’s desk, has been on loan to the Royal Naval Museum (Portsmouth, UK) since the 1980s. However Cage makes a far greater mistake by assuming that there are only two desks.8 What Mr. Cage failed to account for is that the HMS Resolute was constructed from fine aged English oak—and a lot of it. Theoretically, there should be enough wooden artifacts to account for the entire ship, minus sawdust and shavings. And just where do these priceless whaling artifacts end up when they’ve run their course? You guessed it: the New Bedford Whaling Museum. In 1983, Peter S. Grinnell was kind enough to donate the Grinnell desk to the Whaling Museum. Although we here at the Whaling Museum are grateful that Nicolas Cage never busted into our collections in order to try to find portions of ancient Olmec treasure maps, we are certainly disappointed that the producers of National Treasure: Book of Secrets would prefer to invent a fantasy Grinnell desk at Buckingham Palace rather than film the real one here at the Whaling Museum. It’s really a movie-crushing error in what was otherwise a factually sound documentary. The New Bedford Whaling Museum invites you to come see the real Grinnell desk, though we politely ask that you not search for secret compartments, or hidden treasure maps. 1Those interested in the fate of the Franklin expedition should refer to: Carey, John. “Answers From an Icy Grave”, Newsweek. 8 Oct. 1984. 2Illustrated London Times, 27 Dec. 1856; available under Public Domain. 3Colby, Barnard L. For Oil and Buggy Whips. Mystic, Connecticut: Mystic Seaport Museum, Inc., 1990. (pp.78-88). 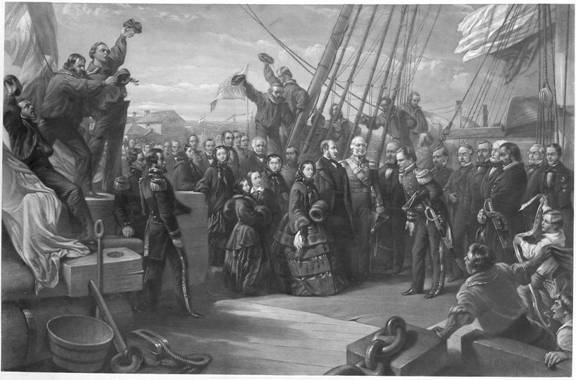 4Image published Jun 7, 1859, “England and America: the Visit of Her Majesty Queen Victoria to the Arctic ship Resolute”; Image courtesy of the New Bedford Whaling Museum. “Across the sea these twins stand resolute to preserve what we are looking for. —Laboulaye 1876”. 6The President’s desk was also altered: Franklin Roosevelt had it raised and couple inches to accommodate his wheelchair, and also had the front panel attached so that his leg braces wouldn’t be in view. 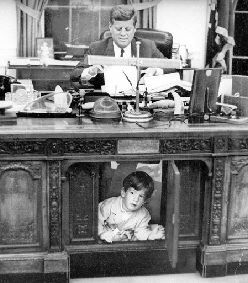 7Photo by Stanley Tretick (1963), available under Public Domain; note Kennedy’s scrimshaw on the desk. 8Cage also gets his dates confused; the riddle quoted above is dated 1876, at which point the HMS Resolute was still in service, and three years away from anything resembling a desk. 9There are also rumors of a fourth desk, a gift to Captain Buddington. However, desks are not the only ends for Resolute timbers. For example, there is a set of wooden bowls which may have been made from the Resolute, though the provenance remains uncertain. 10Kane, Elisha Kent. Picture from front plate of Arctic Explorations in the Year 1853, ’54, ’55: vol.II. Philadelphia: Childs’ and Peterson, 1856. 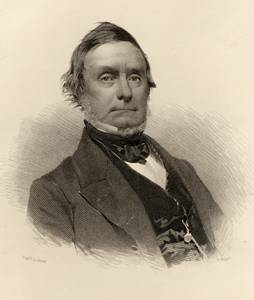 Courtesy of the New Bedford Whaling Museum; Henry Grinnell was born in New Bedford. 11 “A Royal Desk,” The Bulletin from Johnny Cake Hill: A Newsletter from the Old Dartmouth Historical Society & Whaling Museum, New Bedford, MA. Spring 1984. Photo courtesy of the New Bedford Whaling Museum. Who am I supposed to believe, you or Nicolas Cage? It’s for the best that they didn’t get their facts straight. You don’t want Nick Cage in your bedroom: http://www.youtube.com/watch?v=e6i2WRreARo ? This is very interesting, guess you can't learn facts from movies!